The renegade spirit of San Francisco’s underground suppers and pop-ups from about 10 years ago is back, although now there’s something decidedly aromatic in the air, and it’s not just the smell of meat grilling or bread baking… It’s another kind of bake: the unmistakable wafting of cannabis. All over the Bay Area (and beyond), private dinners and events mingling food and the consumption of cannabis in many of its myriad forms—from edibles to vapes to good old-fashioned joints—are the latest hot ticket, and you won’t find a seat on OpenTable (yet). Whether you’re new to cannabis, gently returning to it after a break (all those bong loads you had in your twenties are a hazy memory), or are already a daily toker, there’s a spot for everyone at the table. Some chefs infuse cannabis into their dishes, while others prefer to host smoking sessions before and during dinner and keep the food non-medicated—and some do it all, so you’ll need to keep at least one (bloodshot) eye on your consumption. You’ll find cannabis dinners that are equally focused on wine pairings, while others want to primarily highlight the cannabis pairings—both for the various effects and aromatics—and may even forgo serving alcohol entirely. Just don’t geotag the location in your Instagram post—many of these events are on the downlow. With the end of cannabis prohibition in California in 2018 and legalized recreational marijuana coming in hot, it only makes sense these kinds of events are on the rise in the food-obsessed Bay Area. But with rec comes regulation, so many of the fun and free food events, like “dim sum and dabs” in the back of Harvest on Geary in their private lounge space will be discontinued for now—the bountiful sampling lineup of free vapes, dabs, and joints from sponsors and partners can no longer be offered to recreational customers in order to be compliant. (It was fun while it lasted!) But since medical marijuana card holders can still receive samples, here’s hoping Harvest's food and cannabis events will continue. Many dispensaries with lounges and on-site consumption are in a wait-and-see period about future events as they sort through the recreational regulations and licensing—and prepare to handle a massive onslaught of new customers. 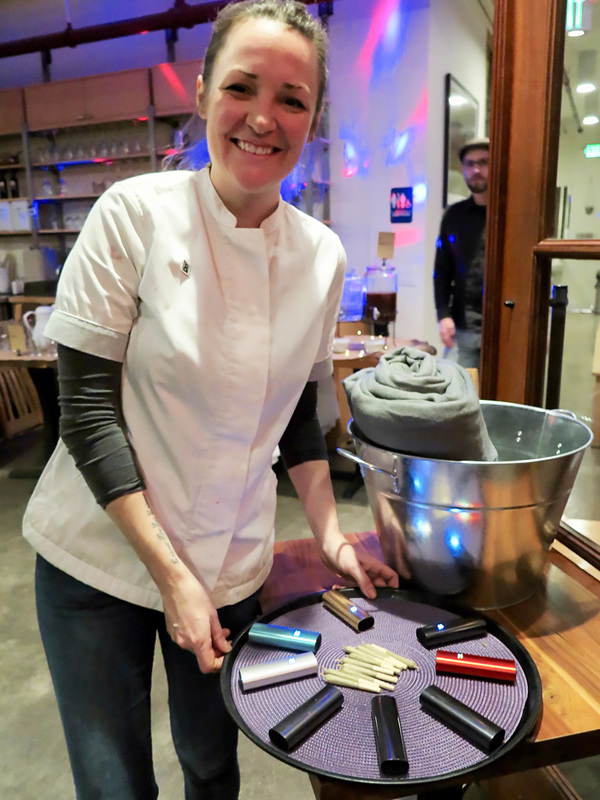 For example, Magnolia Oakland is the only Oakland dispensary with an on-site consumption license, and they host a number of events, including cooking classes. They say they plan to get some events going again by February. 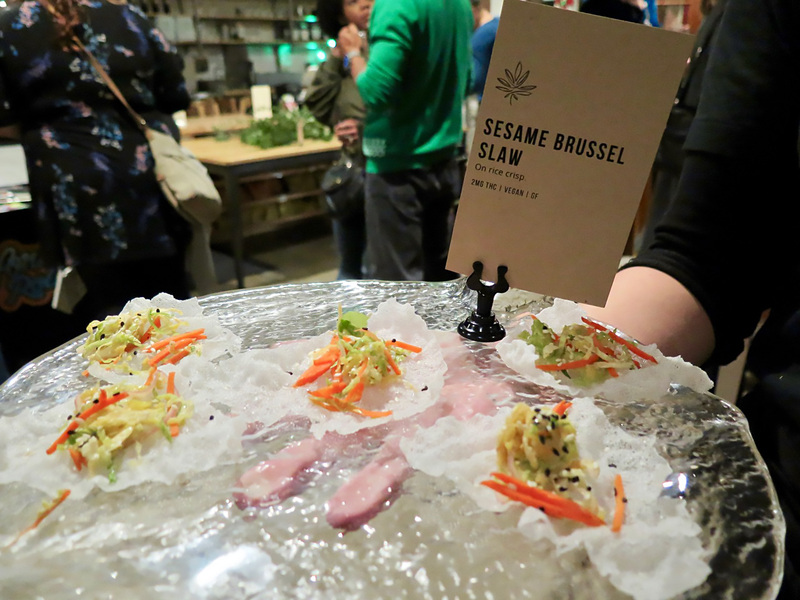 The sophistication and presentation of food can be a little all over the map at some canna events, especially for food-savvy San Franciscans, but the novelty of smoking and ingesting cannabis while dining with a fun crowd can outweigh critiquing the chef’s brunoise too closely. You’ll see a wide range of culinary training, and cannabis experience. 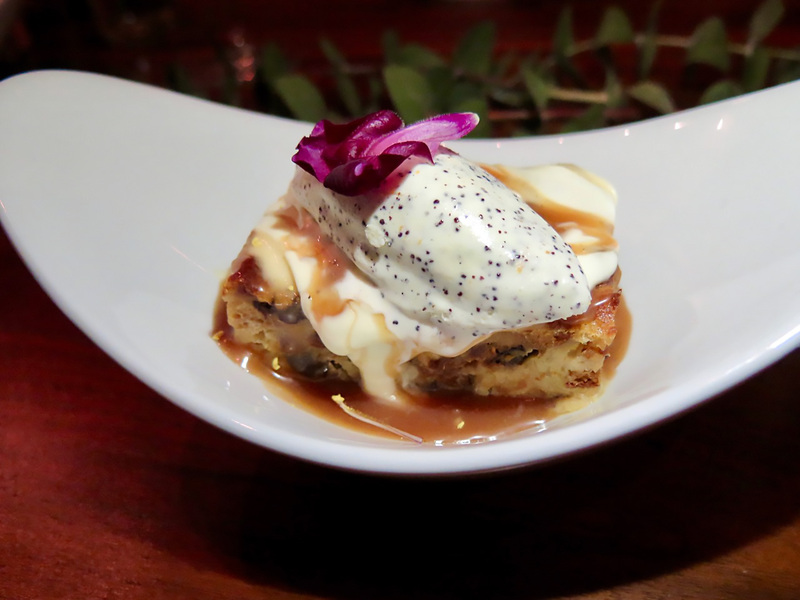 One of the most established, reputable, and thoughtfully curated cannabis dinner parties in San Francisco is The Cannaisseur Series, from founder and chef Coreen Carroll and her husband, Ryan Bush. They score high on the adorable and friendly scale (they are such lovely hosts), and are dedicated to knowing all of their guests’ dietary needs, cannabis experience level, and preferred dosage ahead of time. You’re in great hands. At a recent event, the location was revealed to ticket holders the day before the event, and each guest needed to present a medical marijuana/MMJ card to enter. In 2018, Coreen says they are going to just have it be 21 and over, with no card required (for now), but this could change in a couple months. It depends upon what their sponsors and event partners will eventually prefer (for people to have their MMJ card or not)—so everyone is just figuring things out as they go along. It’s truly the wild west right now. Their latest location in San Francisco featured a well-shielded patio where we could all dine outside and smoke the paired joints and vapes freely throughout the meal, although those who wanted to smoke a cigarette kindly puffed elsewhere. The reception featured passed and low-dose bites (2 mg each and clearly labeled), like spinach arancini with gooey smoked mozzarella inside that you could dip into a bright tomato sauce, and sesame-Brussels sprout slaw on rice crackers, a thoughtful choice for vegans and gluten-intolerant folks. You can see how Coreen attends to their guests’ dietary needs, and since many cannabis aficionados are vegetarian or vegan, they also offer vegetarian menus. The crowd mingled and chattered about products they love, ailments they have found relief for, their favorite topical salve, their preferred dispensary…no shortage of interesting and informative conversations here. Guests could help themselves to some festive glühwein (dosed, 4 mg per serving), red or white wine, or orange iced tea with black elderberry (dosed, 3 mg), or some good old-fashioned water. I am careful about mixing weed and wine, while others like to go full-on bacchanal. You’re in charge of you. But here was my favorite part about the gathering: the incredible diversity of the crowd Coreen and Ryan attract! All ethnicities, ages, genders…and you’ll notice how many women are in the cannabis space (Coreen and Ryan are dedicated to featuring many women-owned businesses). I haven’t been to such a diverse party in San Francisco in ages. And people are friendly. We all know we’re here to hang out and party and it feels like there’s already a barrier removed in interactions—people are warmer, and really connecting. And certainly animated. It’s beyond refreshing to see how cannabis brings everyone together, and events like this create a new touchpoint and intersection we may not have found in our usual lives. This evening’s Holiday Soirée Dinner—on a Saturday smack dab in the middle of December—inspired Coreen to craft a menu of holiday celebratory dishes from many cultures. No menu for this one—just buckle up and enjoy the ride, kids. 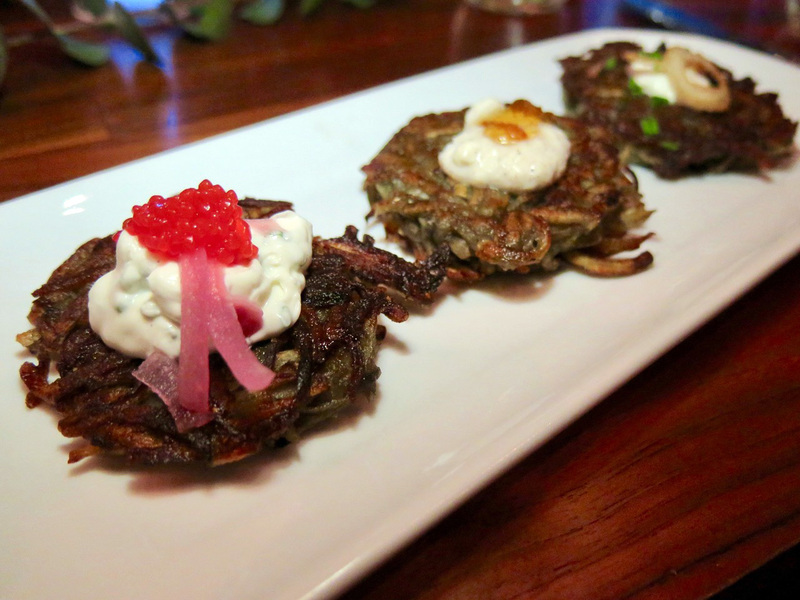 The first course was in honor of Hanukkah, which included a trio of latkes, each with their own topping (ranging from crème fraîche with kelp roe and chives to another with shallots and apple schmear), and canna leaves inside too (her “herbaceous” touch, used for flavor but not for psychoactive effect). Coreen is passionate about using the whole plant (she grows too! ), and as a chef is so inspired by the array of flavors cannabis offers, from salty to sour to sweet, depending on the strain and maturity. The latkes were paired with joints and Pax vapes loaded with Sour Diesel flower (21% sativa) from The Betty Project and presented on trays to each table. Puff puff pass. The sponsors take a moment to introduce their product and pairing at the beginning of each course, so you always know what’s about to come around. Our table featured such a cast of vibrant characters, from the medical professor to the duo that looked like they arrived via a time machine from 1927 to the dispensary owner to a former Bay Guardian colleague to the SF Fran Lebowitz (she had wicked style and panache) at a nearby table. 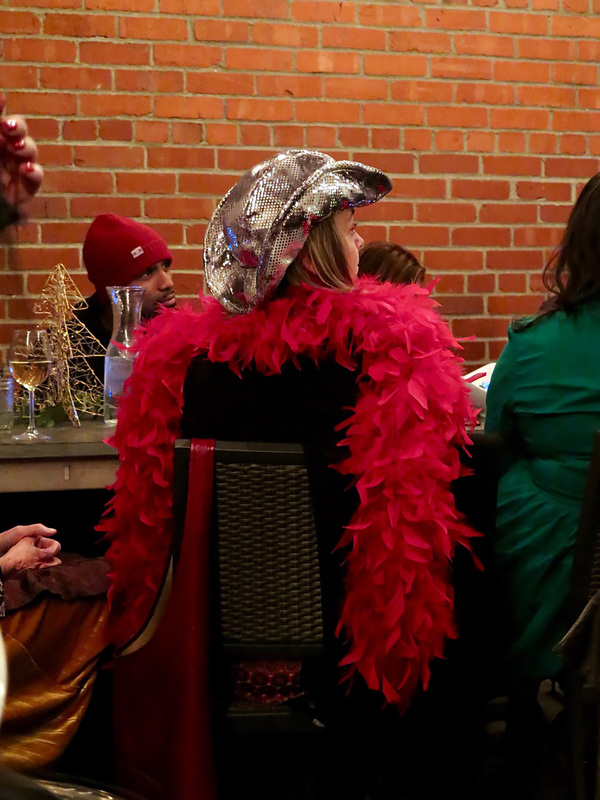 And then there was Miss Feather Boa making the rounds, and other friendly minglers. It was such a bohemian and fascinating and lively scene. I caught a glimmer of the San Francisco I fell in love with when I first moved to the city in 1994, layered with a louche Weimar Republic vibe. People were so funny and kooky and showing up however and whoever they were, and the conversations were all over the map—everyone was flyin’ high, and laughter played a big part of the soundtrack. There were some definite tokers—but even lightweights like me weren’t pressured or felt self-conscious. Everyone has their own speed. The next course of wild boar sausage stew—served in deep bowls with kale and sweet potato and a dreamy rabbit stock—was the perfect big party strategy; vegetarians enjoyed a version with tamari-based stock, equally rich with umami and depth of flavor. 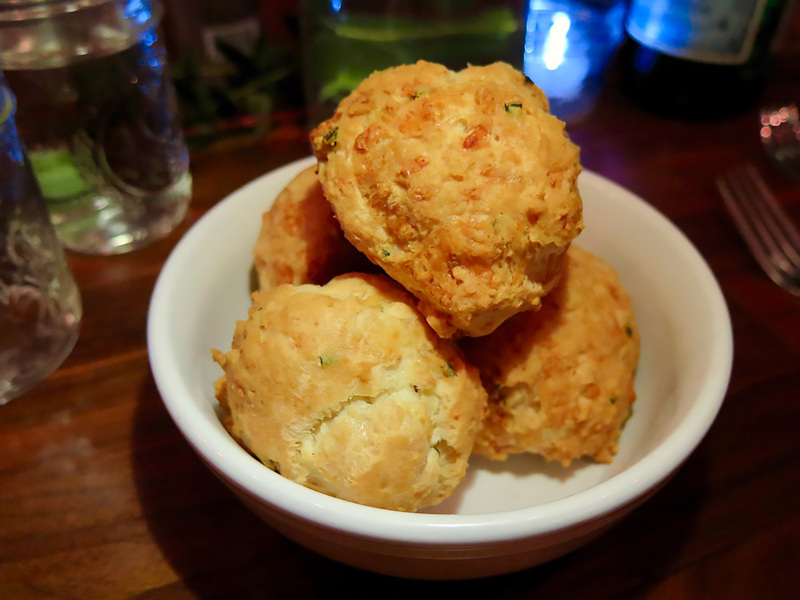 The table sighed over the warm Gruyère and chive gougères that came out too. Munchies in effect. A guest who had attended previous Cannaisseur dinners (they have a tribe of repeat guests!) explained Coreen and Ryan carefully map out the guest’s canna journey for the evening, like in this case starting with a lively sativa-dominant strain, keeping in mind the reception’s edibles should be kicking in soon thereafter, which is when they timed a CBD pairing. It was designed to downshift the intensity, just when the party reached a rather feverish pitch of swirly chatter and laughter (CBD can dial the effects of THC down)—we were offered Park Life CBD sublingual strips from Kin Slips and AC/DC flower from The Betty Project. I definitely appreciated the CBD pairing—I was getting a little cuckoo, and you should see my notes at this point, they were rather cryptic (and there’s no canna Rosetta Stone to help me decipher them). The main dish was a wintery quail ballotine, with black truffle oil salad and puréed beets (with CBD), while vegetarians enjoyed a red pepper pasta stuffed with sweet onion and Swiss chard in a sage and brown butter sauce. I was so high I could barely focus on eating, honestly it was quite a challenge. It’s one thing when you’re at home scarfing a quesadilla in a stony munchies frenzy, but dining on an elegant dish while carrying on multiple conversations with so many interesting people—and hey, look, that joint is back—took an extra level of attention. Food writer challenges at a cannabis dinner are real. The night kept chugging: there was a fascinating talk on terpenes from Dr. Paul, and Amber from Leisure Life shared details about her infused products (and the treats she had for us in the goodie bag, including her California Rolls: Red Congolese prerolls dipped in kief). The dinner was priced at $150, and considering the absolute abundance of food, cannabis, and scintillating company, let alone the gift bag they sent us home with (thanks sponsors! ), it’s well worth it. This is not just a pop-up dinner—Coreen and Ryan have crafted a total experience, greater than the sum of its parts, with so many details to make their guests comfortable and happy. They’ve been doing this for a few years, and it’s not easy to keep a venue full of stoned kittens (somewhat) in the box and on track, but it’s clear they know what they’re doing, and they have an experienced front of house staff to take care of everyone as well. Sign up for their newsletter for announcements of future dinners (like their Winter Wonder event on Sunday January 28th, celebrating the end of cannabis prohibition!) and subscribers not only get first crack at tickets, but they get a $20 discount (for a limited time) as well. Park your paranoia at home and enjoy one of these special evenings. Here are other people and places to follow for tips on future cannabis and food events in the San Francisco Bay Area— feel free to share any tips in the comments! Lisa Rogovin, founder of the well-regarded Edible Excursions Bay Area food tour company, has launched a new side business, featuring highly curated cannabis events that have the same notable level of quality and deep research that her tours are known for. From a CBD dinner with chef Preeti Mistry at her Navi Kitchen restaurant in Emeryville, to a walk-around event with growers and interesting edible makers, Lisa integrates education and experts into her events so you leave with knowledge and an exciting feeling of discovery (along with some great goodie bags). Newbies are especially welcome and comfortable. Stand by for future experiences. 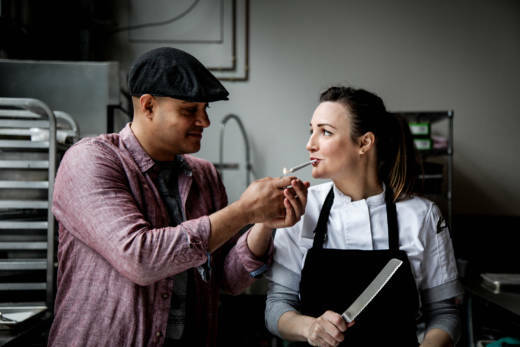 Chef Michael Magallanes comes from a professional culinary background (he has 10 years under his toque, and worked at SF’s Aziza and Mourad for five), and now creates sophisticated, cannabis-infused, multi-course dinners. He’s very attentive to each guest’s tolerance level and customizes the experience for them. He is currently focused on private events for clients, but is planning to host another dinner party soon in early 2018—follow along for updates. Their “Elevated Evening” events pair wine with weed, highlighting the plant's terpenes (aromatics) and flavors, and feature their own sun-grown cannabis (both in flower and vapes). Their luxe events definitely appear to be a cut above, like a crab and cannabis fête with choice wines in their barn on their farm in Cloverdale. This maker of this quality cannabis-infused olive oil (with a newly released CBD version too!) has partnered with chefs on private pop-up dinners, including a recent Filipino kamayan-style feast with itinerant chef Yana Gilbuena of Salo Series. Follow PDH on Instagram for future collaborations. This website features reviews and listings of cannabis dinners and pop-up events throughout the U.S. (and Canada! ), take a look for inspiration and leads (although it takes a little spelunking since you can’t sort by location). Subscribe for the latest updates. This private event space has hosted cannabis dinners in the past, subscribe or follow their Instagram for event announcements. Learn about cannabis and wine and food pairings in this site’s guides, and keep up with event collaborations in their newsletter and on Instagram.